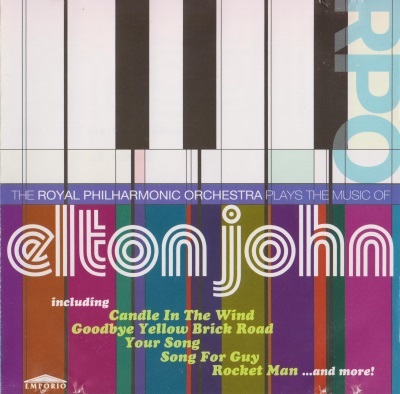 Elton John » Music lossless (flac, ape, wav). Music archive LOSSLESS. Music lossless download. Label: DJM Records, Metronome. Made in DE. Label: Emporio. Made in UK. Label: The Rocket Record Company. Made in DE. 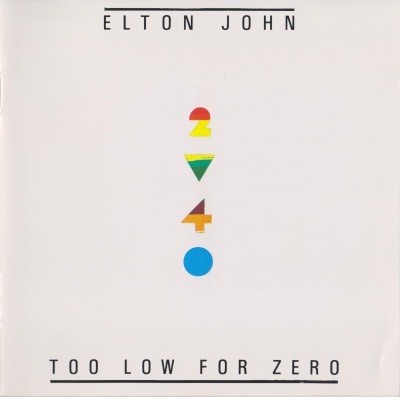 Too Low for Zero (stylized as 2 ↓ 4 0), released in 1983, is the seventeenth official album release for Elton John. The album marked a comeback for John, whose previous four albums had failed to yield many enduring international hit singles, and had disappointing sales compared to his string of hit records released during the first half of the 1970s. It is his best selling album of the 1980s, earning Platinum certification by the RIAA. It produced several hit songs, each accompanied by successful MTV music videos, and it spent over a year on the Billboard album chart. Label: The Rocket Record Company, Phonogram. Made in DE. 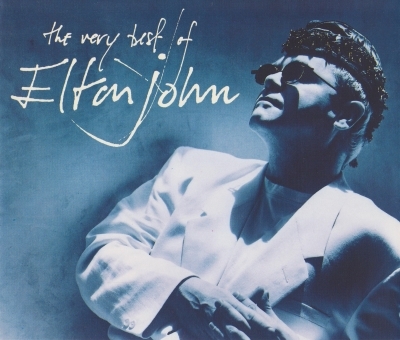 The Very Best of Elton John is a greatest hits compilation album by Elton John, released in October 1990. His first career-retrospective album, and fourth official greatest-hits album overall, it was released in the United Kingdom and throughout Europe, and in other countries such as Japan and Australia, but not in the United States, where the box set To Be Continued... was released the following month instead. 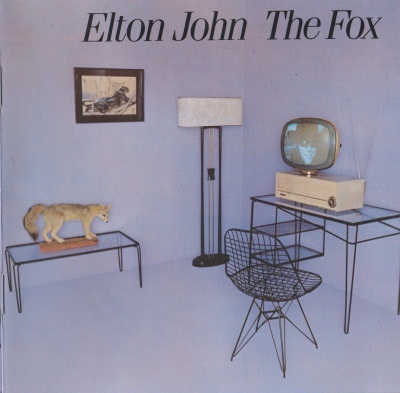 The Fox, released in 1981, is the fifteenth official album release for Elton John. With sales of approx. 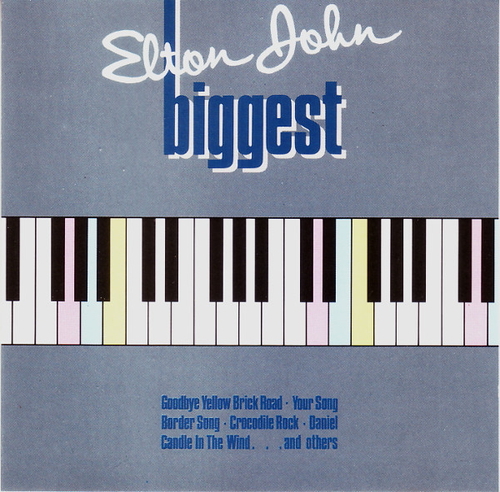 300,000 US copies, it was one of Elton's poorest-selling albums in the United States. 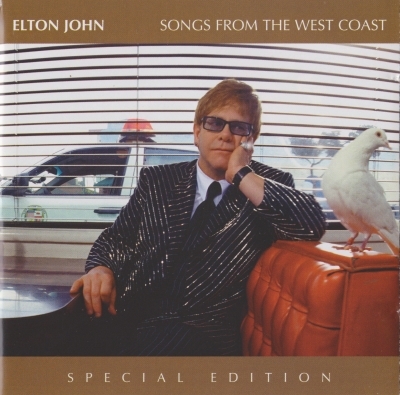 The track, "Elton's Song", was banned from radio play in some countries due to its content, which included references to homosexuality. The album was produced by John, Clive Franks and for the first time, Chris Thomas, who would produce many more albums with John through most of the 1980s and '90s. Label: The Rocket Record Company, Mercury. Made in UK. 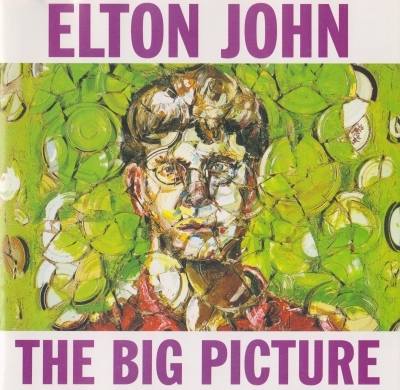 The Big Picture is the twenty-fifth studio album by British singer-songwriter Elton John, released in 1997. It includes four worldwide singles: "Live Like Horses" (a duet with Luciano Pavarotti only for the single version), "Something About the Way You Look Tonight" (released as a double A-side with "Candle in the Wind 1997"), "Recover Your Soul" and "If the River Can Bend". 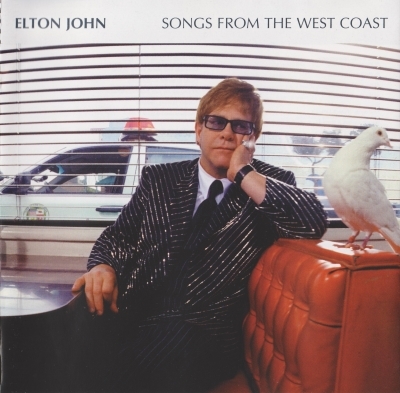 Songs from the West Coast is the twenty-sixth studio album by British singer-songwriter Elton John, released worldwide on 1 October 2001. Many critics have said that this album brought him back to his piano-based musical roots. 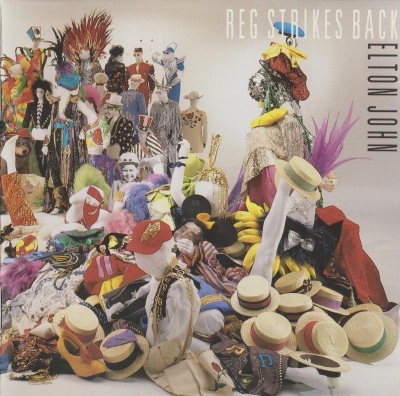 Reg Strikes Back, released in 1988, is the twenty-first official album release for Elton John. It was his self-proclaimed comeback album, and his own way of fighting back against bad press. The "Reg" in Reg Strikes Back refers to John's birth name, Reginald Kenneth Dwight. Label: Mercury, The Rocket Record Company. Made in DE. 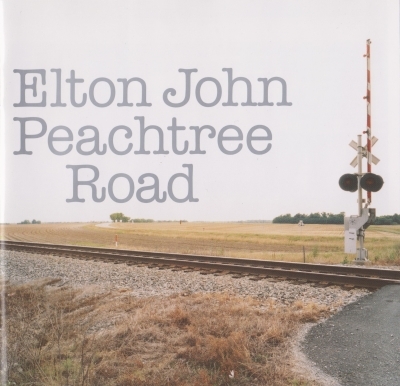 Peachtree Road is the twenty-seventh studio album by British singer-songwriter Elton John, released in 2004. It was named after Peachtree Road, the northern part of Peachtree Street in Atlanta, where one of John's four homes is located. This is the only album during his long career on which John has sole credit as producer. On previous projects, he was listed as a co-producer, joined by Clive Franks or Greg Penny; Franks on A Single Man, 21 at 33 and parts of The Fox; Penny on Duets and Made in England. it was recorded in January 2004. 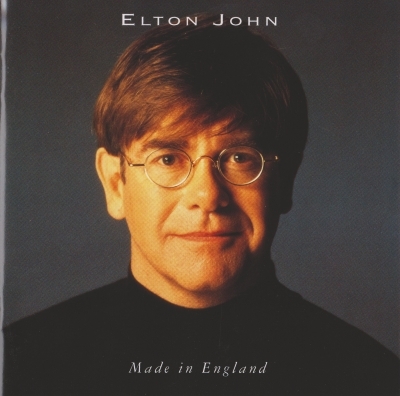 Made in England is the twenty-fourth studio album by English singer-songwriter Elton John, released in 1995 and produced by him and Greg Penny, the first time since Leather Jackets without Chris Thomas. It was dedicated to John's boyfriend and future civil partner David Furnish. It was also dedicated to the memory of Denis Gauthier and Peter Williams. It was the last album to feature regular percussionist Ray Cooper until 2016's Wonderful Crazy Night. Bob Birch became John's full-time recording and touring bass player and continued that role until his death in 2012. Label: Rocket. Made in DE. 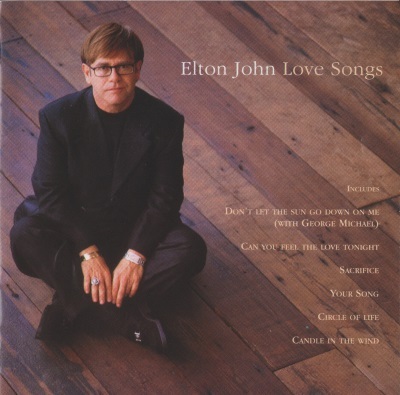 Not strictly a "greatest-hits" collection, Love Songs contains Elton John's most famous ballads, from "Your Song" and "Don't Let the Sun Go Down on Me" to "Can You Feel the Love Tonight." Featuring two new songs, including the single "You Can Make History (Young Again)," Love Songs is designed for the casual John fan who is familiar with his songs through adult contemporary radio. If you don't fall into that category, the compilation is bound to fall short of expectations, but the record nevertheless works well as a collection of ballads and soft rock. Label: Pickwick Records. Made in UK. 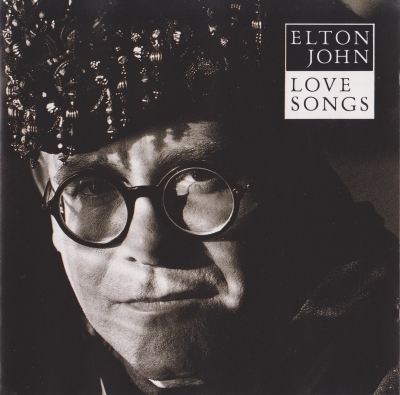 Love Songs is a compilation album by British singer-songwriter Elton John. The album was first released on 6 November 1995 by John's own label The Rocket Record Company, in conjunction with Mercury Records. The album was released in North America by MCA Records almost a year after the European release, on 24 September 1996. In the US, it was certified gold in December 1996, platinum in March 1997, 2× platinum in December 1998 and 3× platinum in August 2000 by the RIAA. The album was a major success upon its release, topping the albums charts in three countries, was certified platinum in 11 countries and multi-platinum in 7. 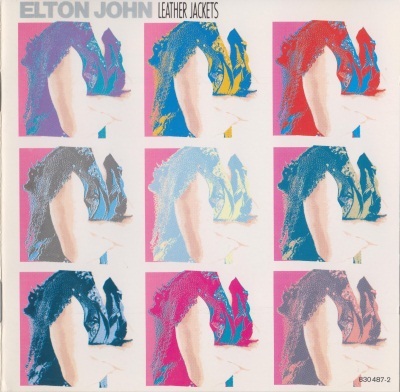 Leather Jackets, released in 1986, is the twentieth official album release for Elton John. Recorded at Sol Studios in England and Wisseloord Studios in the Netherlands, it was his first album not to have any top 40 singles in either the US or the UK since 1970's Tumbleweed Connection, which had no singles released from it. It is also the poorest-charting album of his career. Label: DJM Records. Made in DE. 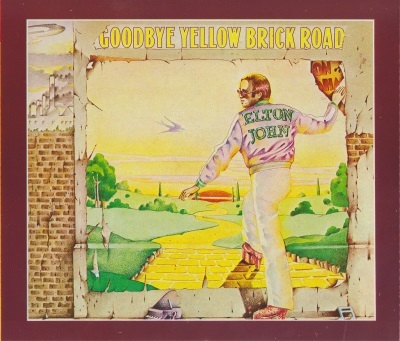 Goodbye Yellow Brick Road был записан в мае 1973 года на студии во французском замке, расположенном в муниципалитете Эрувиль, и выпущен в октябре того же года в США и Канаде на лейбле MCA Records и в остальных странах компанией DJM Records. На пластинке присутствует песня «Candle in the Wind», написанная в память о Мэрилин Монро, а также три успешных сингла: «Bennie and the Jets», «Goodbye Yellow Brick Road» и «Saturday Night’s Alright for Fighting». Это первый двойной альбом в дискографии музыканта. Goodbye Yellow Brick Road стал наиболее успешным в коммерческом отношении альбомом в карьере певца. Он занял первое место в чартах США и Великобритании и получил сертификат платинового диска от Британской ассоциации производителей фонограмм и платинового семь раз - от Американской ассоциации звукозаписывающих компаний. Его мировой тираж составляет свыше 30 миллионов экземпляров.